It is a little known fact that most law enforcement K9 units throughout the United States receive little or NO funding from their departments and must rely on a variety of donations to support their teams. While these units may be able to obtain funding to cover basic necessities to operate their unit, they still do without important and necessary equipment or supplies that could be detrimental to the safety of the dog and/or handler. PA K9 Assistance Foundation was established to help these teams obtain the important equipment and supplies they need to maintain their effectiveness and keep them safe. 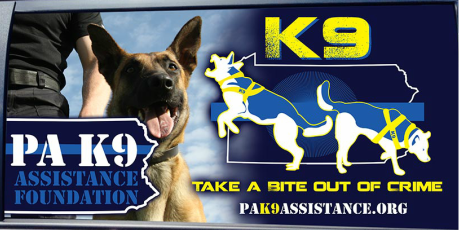 PA K9 Assistance Foundation has partnered with several individuals,businesses and communty organizations that have helped us provide support to K9 teams throughout the Commonwealth of Pennsylvania. Much of that support has been through financial means, but we have also accepted donations of equipment and supplies to re-home to K9 teams in need of that equipment. Donations can be made to honor those particularly special people or pets in our lives that have passed. We will announce the donation in honor of the particular person(s) or pet(s) by sending a special thank you to the donor and listing the donation on our FaceBook site and/or website (if desired). Donations received can also be directed towards a particular law enforcement K9 or unit within Pennsylvania, or that your donation be applied towards a particular piece of equipment, supply, or service that is of need. Given that one ballistic/stab resistant vest or k9 vehicle temperature alert system can cost over $800, no donation can be too small or too large. Any donation we receive is significant. Corporate-business-school organizations have hosted events such as dress down days, cookoff competitions, "give a dollar" promotions and the like that have produced significant profits which have been donated to our organization. For more information on these and other ways to help, contact us. PA K9 Assistance Foundation has received requests for many different types of equipment. We have accepted equipment donations from former K9 Handlers and trainers that have been rehomed to teams. We do require that the equipment be in good to very good condition, working, and/or serviceable. K9 ballistic vests also must be less than 3 years old from the manufacter date. Contact us before shipping ANY equipment. Any equipment submitted to PA K9 Assistance will need to be inspected to determine if it can be rehomed prior to the issuance of any donation receipt. PA K9 Assistance Foundation has previosly purchased specific equipment to rehome based on certain circumstances and conditions. Donations can also be made using a credit card through PAY PAL. PAY PAL accounts are not necessary, and receipts will be directly generated through their site regardless of the amount. ******Honorary donations can be made through the PAYPAL site as well through the notation section towards the bottom of the page. Click on "Donate" button below. A PAYPAL account is not necessary. Most credit cards accepted.